Projects | Land and Sea Marine, Inc.
We’re proud of our efforts and we like to show them off. Can you blame us? Click one of them below to see why! 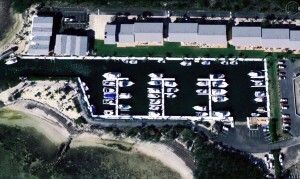 Land and Sea Marine, Inc. was awarded the contract to restore and renovate the 78-slip, privately owned Kawama Marina of Key Largo after a competitive bidding process with many other local and state-wide marine builders. Land and Sea Marine, Inc. was awarded the contract to restore the shoreline and install a new seawall and dock for the Marina at River Run in Sebastian, Florida. 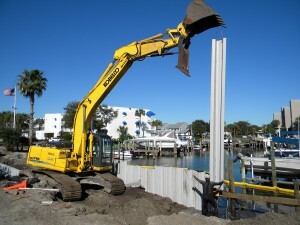 Featuring 550-series Shoreguard® vinyl sheet pilings, an 18×24″ concrete cap, and an extensive tie-back system utilizing fully-sheated 1″ stainless steel rods and continues concrete footer with an embedded steel mat, this new seawall is built to endure decades of anything Florida weather can throw at it. 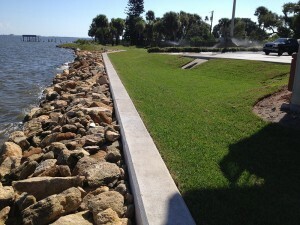 Land And Sea Marine has recently installed a new, 584-foot upland retaining wall that will help protect the residents of the Venetian Bay Condominiums in Palm Bay, Florida from catastrophic structural damage during a severe storm or tidal surge. Construction nears completion at VIP Island. 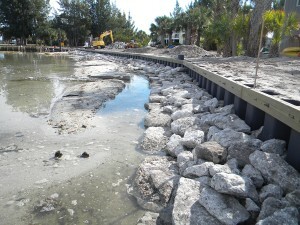 VIP Island in Grant, Florida awarded Land and Sea Marine, Inc. the contract to construct a 403-foot seawall to fortify the previously unprotected north point shoreline. The shoreline was continuously eroding, threatening the security of the adjacent residences. Now, the residents of VIP Island’s north point enjoy the protection of a durable new seawall that is built to last a lifetime. 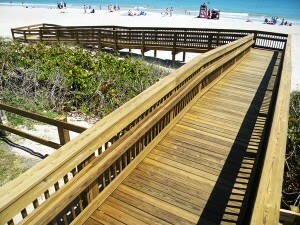 This new dune crossing was constructed for the Town of Melbourne Beach at Ocean Park at the beach access point on the East end of the town’s main street, Ocean Avenue. Featuring modern decking materials and the best quality fasteners and lumber for durable beauty and long life, the crossing was built to comply with strict Americans with Disabilities Act requirements for special needs access.